It will all come down to the last race of the Blue Water Pointscore Series – the Audi Sydney Offshore Newcastle Yacht Race - to see if Syd Fischer and his TP52 Ragamuffin can claim an historic tenth victory in the Cruising Yacht Club of Australia’s prestigious championship. Ragamuffin currently leads the Blue Water Pointscore Series on 15 points, with Bob Steel’s Quest, also a TP52, one point behind on 16 points, and Ed Psaltis and Bob Thomas’ modified AFR Midnight Rambler sitting in third place on 17 points. Those currently sitting in fourth and fifth place on the Blue Water Pointscore leader board, Geoff Ross’s Reichel Pugh 55 Yendys (18 points) and Stephen Ainsworth’s RP 63 Loki, cannot be overlooked. In last year’s 213 nautical mile race, Loki claimed the trifecta of line honours, IRC Overall win and the race record of 15h-57m-53s. 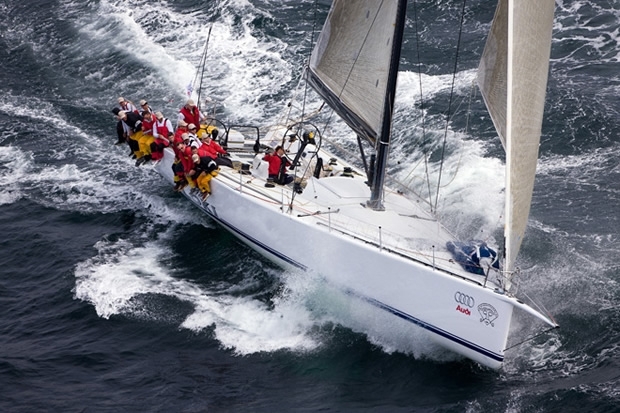 The Audi Sydney Offshore Newcastle Yacht Race will start at 12 noon on Friday 19 March from Sydney Harbour and take the fleet to a laid mark around 20 nautical miles east of Crowdy Head before the yachts head for Newcastle and the finish in the Hunter River. The Notice of Race and entry forms are now available on the official race website and CYCA Commodore Matt Allen encourages entries into the third edition of the race. “As the last race of the Blue Water Pointscore, the Audi Sydney Offshore Newcastle Yacht Race is an integral part of the summer sailing program at the Cruising Yacht Club of Australia. This is often a closely contested race with owners keen to place well, thereby ensuring a strong finish in the Blue Water and Tasman Pointscore series,” said Allen. “I encourage owners to enter this often fast-paced race north and support the event, along with Audi, one of the leading sponsors of competitive yachting in Australia,” concluded Allen. This race is an important kick-off event for Audi’s sponsorship of CYCA races each year, according to Anna Burgdorf, Audi’s General Manager Corporate Communications. “Each year, Audi supports a number of key events organised by the CYCA and this first offshore race is a great kick-off to our season with the Club. Audi’s commitment to competitive yacht racing certainly continues throughout the year and we look forward to seeing a high quality fleet, and ideally a record number of entries to ensure this yacht race continues to be an exciting conclusion to the CYCA Blue Water Pointscore series,” said Burgdorf. The Tasman Performance Series has already been secured by AFR Midnight Rambler, which is 11 points clear of Steven Proud’s Sydney 38 Swish and Anthony Paterson’s Ker 11.3 Tow Truck from Lake Macquarie, which are currently tied in second place. The race finishing partner for the Audi Sydney Offshore Newcastle Yacht Race, Newcastle Cruising Yacht Club, is looking forward to hosting the fleet in late March 2010.